Biological Synopsis: Fishes of the family Channidae are commonly referred to as snakeheads and consist of two genera (Channa and Parachanna) and approximately 21 species. Eighteen species from the genera Channa are native to Asia while three species from the genera Parachanna are found in tropical Africa. Snakeheads are freshwater fish, but a few may tolerate low salinity waters. Snakeheads can resemble native bowfin, have well toothed jaws and palates, and breathe atmospheric air through the use of a simple labyrinth organ. The ability to breathe air allows snakeheads to survive in habitats with low dissolved oxygen. They can also survive out of the water for several days if their skin remains moist. The northern snakehead (Channa argus) is a native of the Yangtze River basin in China. It can reach over 33 inches in length and tolerate a wide range of temperatures (32-85°F). This fish prefers stagnant shallow ponds,swamps, or slow moving streams and rivers with mud substrate and aquatic vegetation. Female snakeheads average about 40,000 eggs but can release up to 100,000 eggs and can spawn multiple times per year. Newly hatched larvae are protected by one or both parents until they reach the juvenile stage. Sexual maturity is reached in two years when the total body length is about 12 inches. The USGS has more information on their website​. Environmental Concern: The northern snakehead has been described as a voracious predator of fishes, freshwater crustaceans, and amphibians. Its native range (24-35°N) and temperature tolerance (0-30°C or 32-85°F) indicates that, if introduced, northern snakehead populations could become established throughout most of the contiguous United States and possibly adjoining Canadian provinces. Because of their feeding style, they could outcompete popular sport fish such as largemouth bass. Biologists are also concerned that they could introduce parasites and diseases that could harm native species. Snakehead Occurrences: In 2002, a reproducing population of northern snakeheads was discovered in a pond in Crofton, Maryland. The snakeheads were exterminated and subsequently assigned injurious wildlife status under the Federal Lacey Act which prohibits import and interstate transport. A mid-Atlantic Aquatic Nuisance Species council was formed and a management plan for northern snakeheads​ was drafted. Despite intense media and political attention, increased awareness did not serve to prevent further introductions. In 2004, northern snakeheads were found in the Potomac River near the nation's capital and have since established a reproducing population. Northern snakeheads have also been found in Arkansas, Pennsylvania, and New York. Knowledge gained from Maryland introductions: Political leaders and biologists have learned from the introductions in Maryland that snakeheads can quickly start reproducing once released in a body of water. 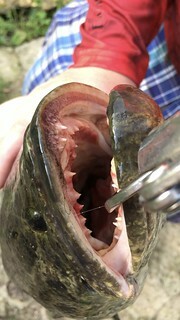 This important information helped motivate local, state, and federal officials in Arkansas to pursue aggressive efforts to eradicate northern snakeheads from irrigation ditches and prevent spread into the Mississippi River watershed. Officials in New York have also pursued control measures to prevent snakeheads from colonizing the Hudson River. A statewide plan to address these introductions was adopted in 2016. Mitigation: Unfortunately, northern snakeheads have become firmly established in over 60 river miles of the Potomac River. The U.S. Fish and Wildlife Service with its partners, continue to conduct research to assess impacts on the ecosystem and effects of the snakehead introduction on fish populations. Research conducted in the Potomac River includes electrofishing surveys to determine distribution and feeding habits, telemetry tagging to assess daily and seasonal behavior, and angler surveys to determine effects of the growing snakehead population on recreational fishing. The Virginia Department of Game and Inland Fisheries, Maryland Department of Natural Resources, D.C. Fisheries and Wildlife, and The U.S. 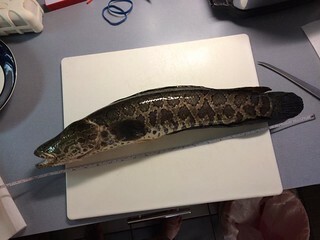 Fish and Wildlife Service have placed reward tags on snakeheads to estimate the size of the population in the Potomac River and learn more about how they are moving in the river and its tributaries. Learning about the biology and behavior of this fish will help biologists determine more efficient methods of removal and control. Read this infographic​ about the abundance trends in some of Maryland's main rivers. What can you do? If you catch a northern snakehead, harvest it. If the snakehead has a tag, measure the length, make note of the exact location of capture, and call the toll free number printed on the tag. Information that you provide is important in determining control and management strategies.